A young homeless boy who emigrated to the United States from Nigeria has been lifted out of poverty through the most unlikely of hobbies: chess. 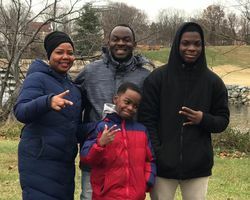 Fearing that, as a Christian family, they would become victims of Boko Haram militants, Tanitoluwa Adewumi and his family fled the West African nation in 2017, attaining asylum in New York City. Becoming residents of a local homeless shelter, Adewumi began to teach himself chess as a way of passing the time. After a little while, the extremely bright young man began to excel at the game. In just a little more than a year after first learning the game, Adewumi managed to secure first place at the 52nd New York State Scholastic Championships tournament for kindergarten to third-grade players. An astonishing feat for a little man who has been through so much — but that is not where this story ends. Adewumi and his family still remained holed up in New York’s homeless shelters, which is no place for such a young boy. Incredibly, that’s when the public stepped in to offer a helping hand. From the press coverage Adewumi received as a result of his chess playing successes, a GoFundMecampaign was set up and quickly began to gather steam. In just ten days, some $246,000 was raised for Adewumi and his brave family. “To whom much is given, much is required,” wrote Tanitoluwa’s dad, Kayode Adewumi, in an update on the page, noting that all the family’s needs had “been met.” They now had a house, legal assistance, jobs and living costs. “So we take our blessings and give them back to God and to the World,” he said. Despite going through so much, the Adewumi has kept their faith alive. Of the money raised, they vowed to sow ten percent back into their local church, which has been instrumental in helping them find their feet. As for the rest of the money, Kayode said that they will be using it for the benefit of other African immigrants who are having trouble settling into life in the United States. The funds will be distributed through their newly formed organization, the Tanitoluwa Adewumi. We want to “share the generosity of others to those in need,” the family noted on their GoFundMe page. God bless this wonderful family!